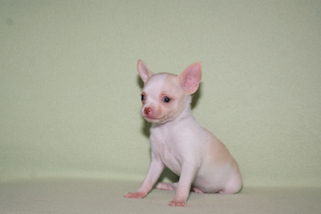 We raise all of our chihuahua puppies for a sound body and mind as well as a bubbly, outgoing personality. 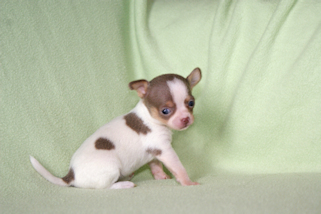 All of our chihuahua puppies have been raised in our loving home and come to you pre-spoiled by my family and myself. 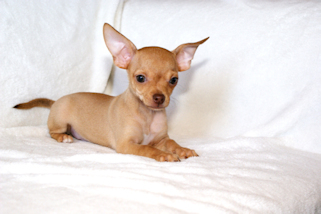 All chihuahua puppies will have had a minimum of 2 sets of shots and been wormed at least once before they leave. Vaccinations & wormings will be continued throughout their stay at our house, at intervals that are appropriate for their respective ages. Our prices range from $700-$1,800. 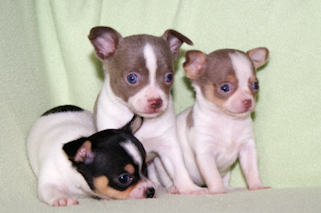 Each puppies' price is listed with their name and photo. They will be at least 8 to 10 weeks old or older before they will be allowed to go to their new homes, and they will be fully weaned and already eating solid food. They may need to stay longer if we feel they are not eating properly or if we feel they are not ready to go to a new home just yet. All of our puppies and young adults are started on the litter box method of housetraining, and we will discuss this method in detail when the puppy is being adopted. We do give a five year written genetic health guarantee. See our About Me page for information about our guarentee. Please E-mail me at ahkennel@gmail.com for deposit information. A personal phone call is a requirement. 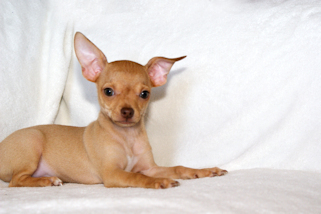 ALL chihuahua puppies are sold with a Spay/Neuter contract and limited AKC registration. If there are any questions about our breeding policies, guarantees, ethics, opinions on showing and shipping these tiny animals, etc. please read our "About Me" page first. 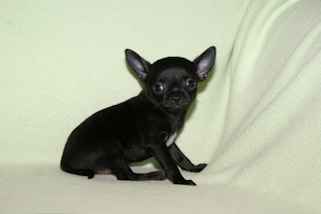 We are located in Bristol, Virginia, which is right on the Virginia/Tennessee border, and we do NOT ship our puppies. A map of our location can be found on our Contact Us page. If that doesn't answer your questions, then please feel free to E-mail me. Please note that puppies in the photos may appear much larger then they actually are depending upon which angle or the zoom lens that the pictures were taken with. Also take note that that actual color of the animal may vary slightly from the photos. This is because of the differences in computer monitors and their ability to display various tones and shades of color. The biggest changes are evident in shades of blue & chocolate and shades of fawn & cream. Colors listed are based on the actual dog's coat coloration, not the photos. I am sorry, but due to our taking many photos, this page will be brief and photos numerous. Because of their being so many photos, it may take a while to load. Please be patient for the photos to load. 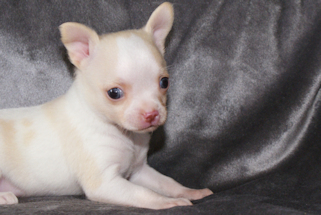 If a chihuahua puppy has the words "ADOPTION PENDING" under their photos or description, this means that a deposit is on it's way, but has not been received yet. 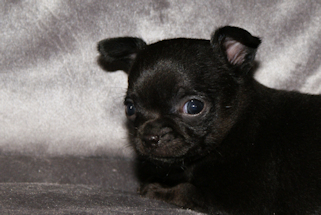 If a deposit has not been received within 2 days, the puppy will be placed back up for sale. 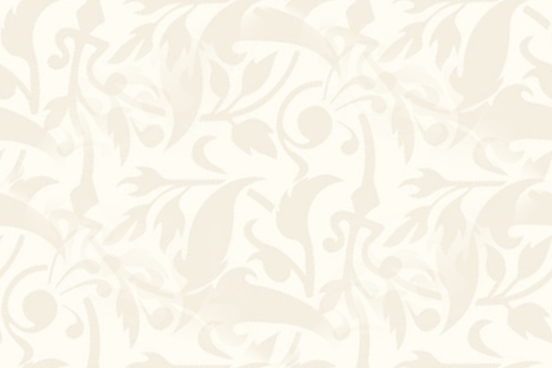 We will update the page as soon as status changes. 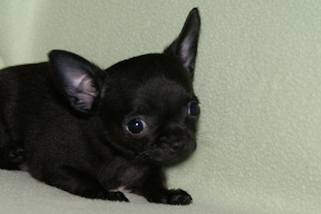 We at NO time sell our chihuahua puppies to petshops, puppy brokers, third parties, or puppy mills. We feel that all puppies deserve the right to become part of a loving family. This is also why all of our puppies are sold on a spay/neuter contract and limited AKC registration. We reserve the right to refuse a sale to any person, at any time. 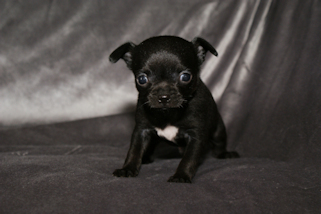 Some of the puppies available are older puppies or young adults. These sweethearts are still young enough to be a puppy, and still have many puppy-ish actions and attributes, but are a little more mature. Sometimes the puppies available have already been spayed/neutered, those that are already altered will be notated in their individual description. The older puppies are completed on their puppy shots. 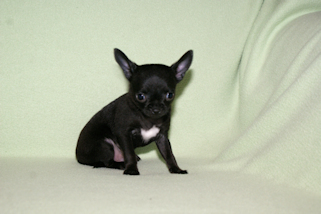 The younger puppies available will have current vaccinations appropriate for their respective ages. 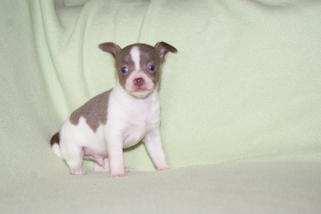 This handsome boy is estimated to mature around 5½ lbs. He will be priced at $1,000. Photos at 12 weeks of age. This handsome boy will be priced at $1,000. Photos at 5 and 6 weeks of age. 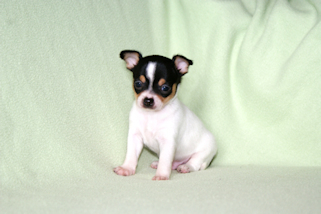 Photos at 4½ weeks of age. This handsome boy will be priced at $1,500. 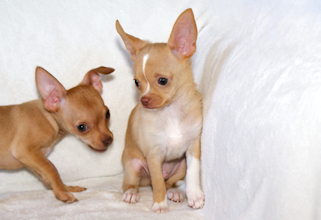 Animal Haus Chihuahuas is not in any way affiliated with the many similar named organizations or companies on the internet. These include several pet shops and another chihuahua breeder, as well as a new rescue group located in Florida. We do not know these people nor do we have any connection to them. We have had the name of Animal Haus for over 30 years, a claim that many of these similar named companies cannot make. 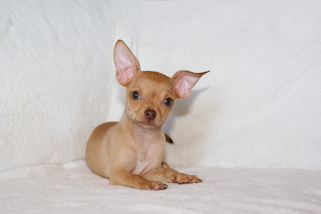 When making any correspondences with us, make sure that you are dealing with Robin Colley of Animal Haus Chihuahuas in Virginia and that you have found our website address: AHKennel.NET or AnimalHausChihuahuas.com , not those of the copy-cats (which are "coincidentally" very similar). We have also recently acquired AHKennel.COM. We also do not correspond with any other email address other then the two mentioned above, ahkennel@aol.com and ahkennel@gmail.com as there is another scam going around where breeders entire advertisements are being stolen and replaced with false contact information. 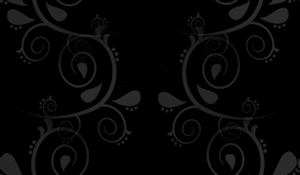 These sites sometimes contain mirror websites that look legitimate, but are not. Please be cautious any time that you are dealing through the Internet, and make sure that all details match up before making a deposit. We also do NOT, nor will we ever, ship our puppies-this scam states that payments must be made in full and puppy will be shipped to you. This scam requires payment in full or in a large portion through Money Gram or Western Union- I have not nor will ever use these services for deposits. We do however do use paypal for deposits, for your convenience, which is a legitimate website and all transactions come with receipts and are easily traceable. Paypal also has security measures to help you from being conned or scammed. I repeat, if you find an advertisement with our information but with a different contact information or requiring alternate forms of payment or payment up front, then it is NOT us. If you run across any similar type scams, please do bring it to our attention so that it can be turned over to the authorities. Most of these scams say that we are located in various states, including the mid-west and Florida. 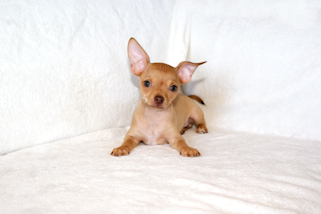 Animal Haus Chihuahuas is located in Virginia, and will continue to be located in Virginia. You can read through our Buyer Beware page for more information on how to spot scams and frauds online. We do reserve the right to deny or refuse an adoption at any time. We try to keep our puppies pages current, updating it when necessary, and when a puppies' status changes. 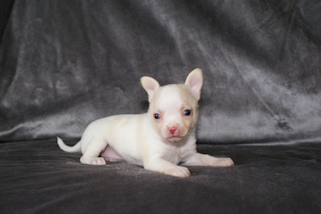 Puppies Availability status is current as of April 18, 2019. Puppies Availability are current and updated as a status changes, but feel free to email or call to confirm that a puppy is still available. All images and material on this entire site were created by and are property of and ©Animal Haus c/o ©Robin Colley and are absolutely NOT to be reproduced, used, copied, or saved in any way, shape, or form! Notice: Our Primary email address was previously ahkennel@aol.com, which we have used continuously for many years. However, due to a huge amount of complaints of people having difficulties in emailing AOL accounts, and difficulties in us responding to emails through, we have chosen to move to Gmail as our primary email account. We will continue checking and replying to our AOL mail, but we are trying to move to a more reliable email provider. If you have previously emailed us at our AOL address and we did not respond within a few days time, please send your letter to our new email address at ahkennel@gmail.com.